The system user is not allowed to log in to Plesk. Customers obtain their system users' access credentials from their service providers and use these credentials for connecting to the server through FTP, SSH, and so on. In addition, all operations with files and directories in Plesk are performed on behalf of system users. For example, when a customer adds a new file in File Manager, the subscription's system user becomes the owner of the file. Make sure that one of the above user accounts is used for logging in (not system user). Also, check the username. 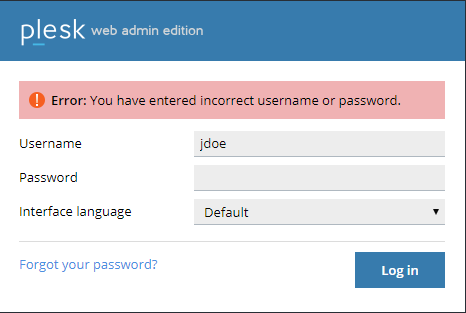 Sometimes, it is needed to specify a full name like "johndoe@example.com"
I followed the directions for creating an additional administrator account, but it gives me the same error as above. In addition, I am unimpressed with your customer support. My plesk id indicates that I am not a "partner", but the hosting provider, gives not support for your product. How am I supposed to receive assistance? Please help me resolve this should be minor, issue. Hi @Paul, could you please describe your issue in details? I purchased hosting with OVH. It came with Plesk 12.0 and Centos 6 installed. After getting the login information, I attempted to create a new user with administrator rights. I can see the user in the Plesk control panel, under the "user" tab, however, when I try to login using the new username, it indicates it cannot be found. Our websites are not working, and the admin credentials also does not work, a year back previous IT head had changed all the email address for our organization and I guess he has missed updating the same for plesk. So forgot password also is not working, tried your support chat but I am unable to get through due to contact partner and do not have any license details. Our hosting server shows ns2.example.com:8443 and ns1.example.com:8443 and I am unable to login. Do let me know what should I do ? PLEASE HELP !!! In case you have server access via SSH or RDP, use this instruction to generate one-time link to access Plesk and change admin password.